I had a good week this week. Got some good news on Friday about a job I applied for. Interview on 4th October! So that's good, and I got something SPECIAL in the post! As you will see in a moment! 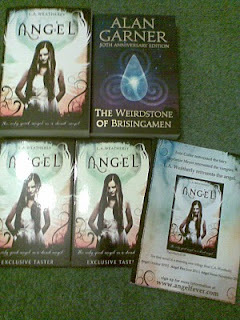 A very Angel-ish week! 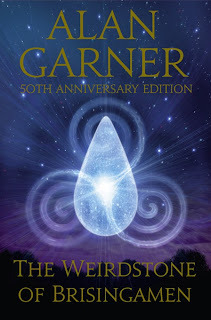 The Weirdstone of Brisingamen by Alan Garner. "A tale of Alderley. When Colin and Susan are pursued by eerie creatures across Alderley Edge, they are saved by the Wizard. He takes them into the caves of Fundindelve, where he watches over the enchanted sleep of one hundred and forty knights. But the heart of the magic that binds them – Firefrost, also known as the Weirdstone of Brisingamen – has been lost. The Wizard has been searching for the stone for more than 100 years, but the forces of evil are closing in, determined to possess and destroy its special power. Colin and Susan realise at last that they are the key to the Weirdstone’s return. But how can two children defeat the Morrigan and her deadly brood?" I haven't actually heard of this before, but I was sent the sequel a week or so ago and when I did some googling, saw the mass love for this book so I am looking forward to reading this! Thank you to Harper Collins for this! Right, first off, two samplers! These feature the prologue and the first 2 chapters. 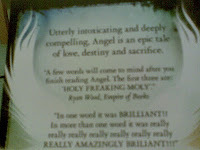 And I'm quoted on the back! And then a finished copy came through yesterday!! It's so cool! The cover is brilliant and it has this finish to it that feels really nice when you touch it. Almost like fabric. Very cool. And I am quoted in it! :D ARGH! PICTURE BELOW! Although it's not very good quality! 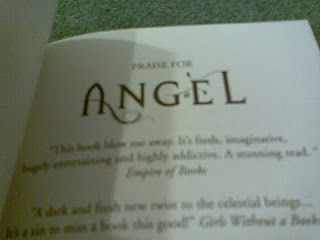 Angel is published on 1st October, so get saving them pennies and buying it. It's awesome (review here). 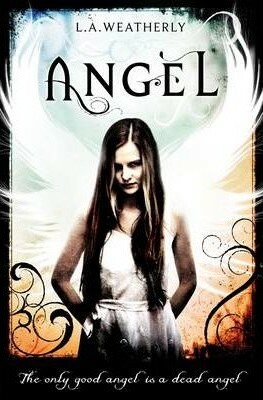 Also look out for something cool coming soon Angel related. I'm very excited about that! awesome news on all fronts! I got Weirdstone as well this week looks an interesting read. Weirdstone is brilliant. I still have my old copy - though it can't be quite 50 years old! Angel is brilliant too, but it's nice to see old books aren't forgotten. I've never heard of the Alan Garner book. It's clearly a classic. I'll have to look it up.